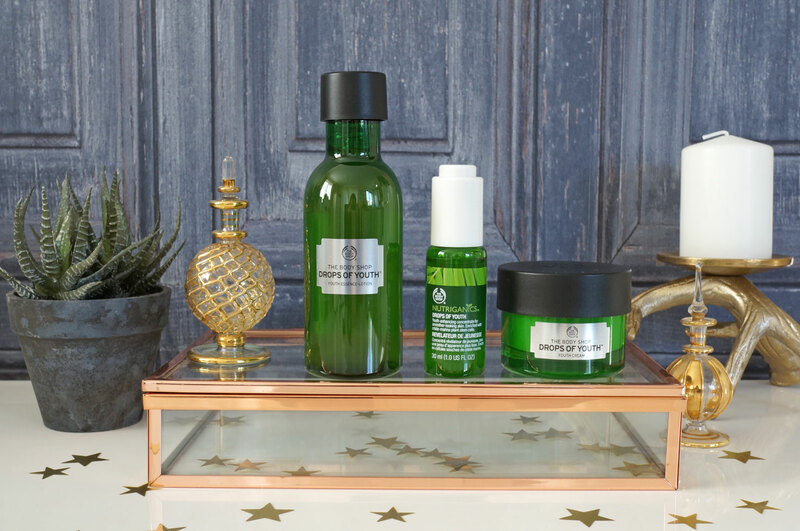 I have some new skincare goodies from The Body Shop to share with you today! 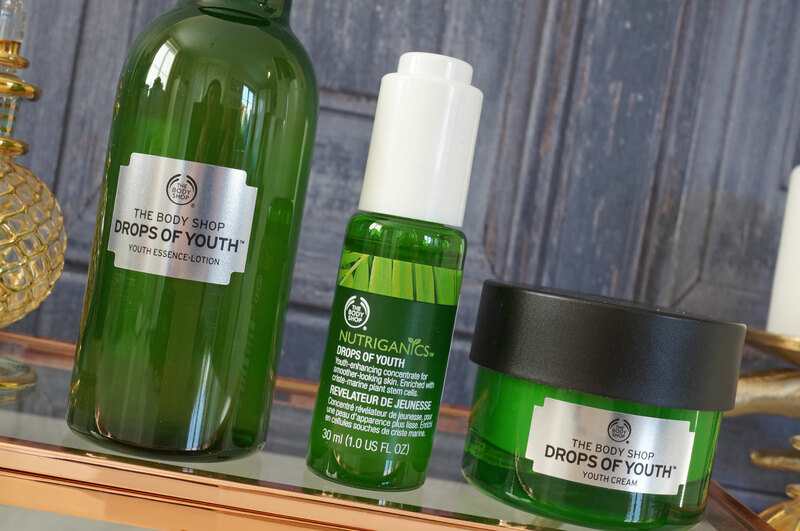 Following on from their popular Oils of Youth collection which was released towards the end of last year, The Body Shop have just launched their brand new Drops of Youth range. 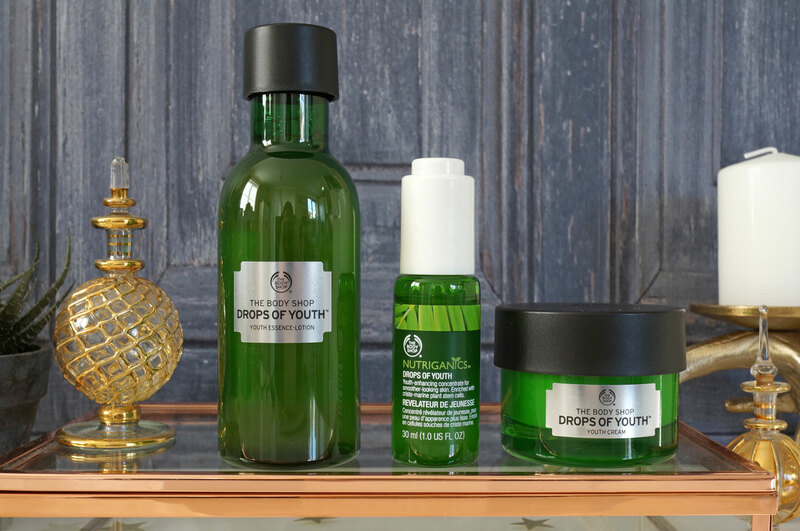 The Oils of Youth products were obviously oil-based, and though the line is very similar in terms of the range of products on offer, the Drops of Youth collection is described as a Youth Enhancing Skincare routine, aiming to tackle the first signs of ageing, giving smoother, bouncier, and more youthful-looking skin. The Drops of Youth products contain stem cells from three plants: Criste Marine, Sea Holly, and Edelweiss. I can’t really find any details on how these affect or work on the skin though I’m afraid – please feel free to point me in the right direction if you can help me here! So I’ll just let you know what I think of the products on face value. Firstly let’s take a look at the Youth Essence Lotion (£14.00) – this product is to be used after cleansing to prepare skin before moisturising. It has a gel-to-liquid formula, which promises to instantly smooth skin whilst replenishing moisture – and that it does! I applied this as directed and it did, in fact make my skin feel smoother. I’m not so sure about how moisturised it was, but this product definitely gave me lovely silky soft feeling skin. The Youth Concentrate (£25.00) – this helps to enhance the condition of the skin, leaving it looking smoother, fresher and healthier, as well as instantly moisturising. This product has the silkiness of a serum, but the consistency also reminded me of a gel at the same time. I must say I wasn’t quite as impressed as I’d hoped to be, don’t get my wrong it is a nice little product, and it did feel lovely to apply, I just didn’t really get the instant moisturisation I was expecting with this one. And lastly the Youth Day Cream (£20.00) – this is a gorgeous light and velvety air-whipped moisturising cream, that aims to leave skin feeling smoother, more supple and refined with a youthful-looking bounce. This is probably my favourite product out of the three. My skin loved this! It sank in in some sort of record speed (considering the amount of product I accidentally slapped on the first time) and left my face feeling amazingly well hydrated and comfortable. The products all have a fresh, light and pleasant scent – I’m not a fan of strongly scented skincare products so this is definitely a good thing in my opinion, but I was mostly impressed with how fast they all sunk into my skin, leaving no residue or tackiness. My skin actually felt quite matte after application too – which is always a plus, as well as being nicely hydrated and just a bit brighter. I’ve only used these products a few times so far, but I’m definitely impressed with them as a trio. In my opinion this is a skincare range that does the job as well as being affordable, so they get a thumbs up from me! I’d love to hear if you’ve tried any of these products?